Digital Forsyth | Swimmers at Reynolds Park pool, 1959. 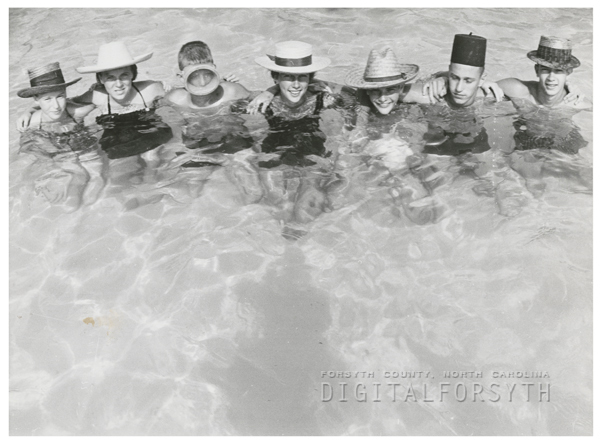 Home › Photos › Swimmers at Reynolds Park pool, 1959. Swimmers at Reynolds Park pool, 1959. Swimmers at Reynolds Park pool, 1959. They are: Carolyn Mabe, Vickie Pardue, Wake Wagner, Susan Plemmons, Jerry Stockton, Tommy Shover, and Leland Ferguson. Want a print of this photograph? Request a print. Remember this photograph? Know someone in it? We want to know. Leave a comment or enjoy what others have said. Just fill out this simple form! Note: By submitting this form, you give Digital Forsyth permission to reuse your comment on the website and in related project communications. Comments are moderated. The materials in this collection are made available for use in research, teaching and private study. Images and text may not be used for any commercial purposes without prior permission from the Forsyth County Public Library. When use is made of these images and texts, it is the responsibility of the user to obtain additional permission as necessary and to observe the stated access policy, the laws of copyright and the educational fair use guidelines. All FCPL photographs must be credited as follows: Courtesy of the Forsyth County Public Library Photograph Collection. See more photos in these categories.